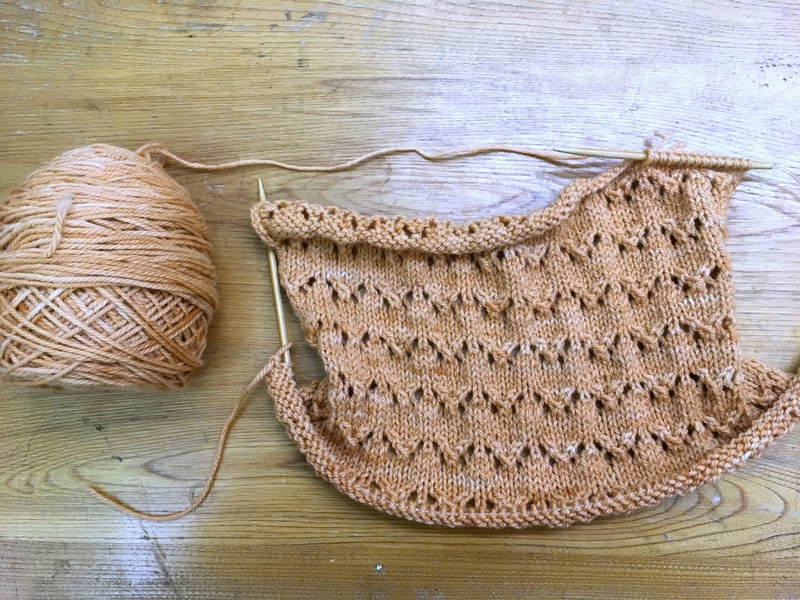 As much as I love playing with cables and lace in summer, sometimes I just need simple. 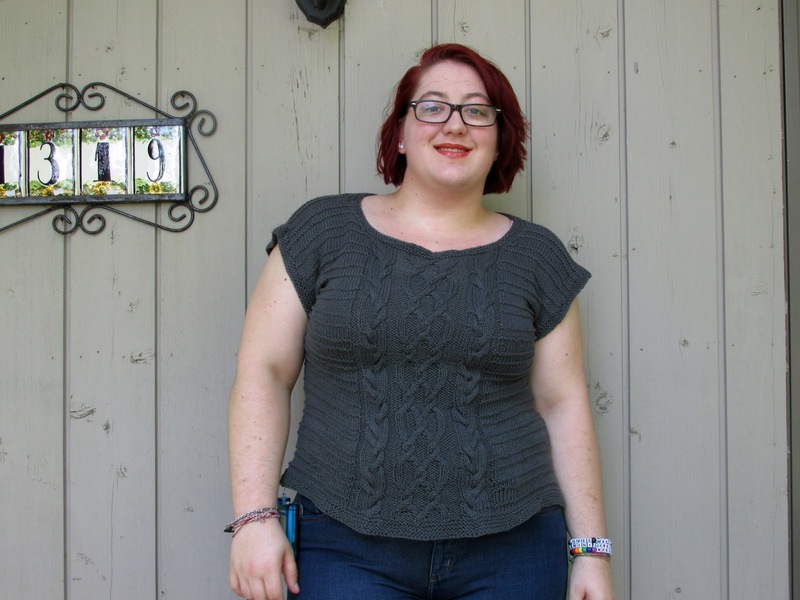 Briar is understated, with just a hint of interest at the shoulders and upper back, and is easily at home on a hiking trail, in a porch swing, or at date night. Briar is worked in two pieces from the bottom and seamed. 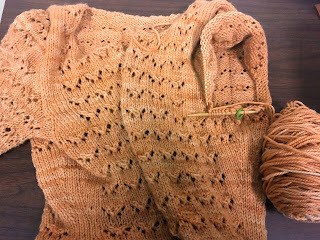 Stitches are picked up for sleeves and neckband, which are worked in the round. The finished garment measures 31(34, 37, 40, 43, 46, 49, 52, 55, 58, 61, 64)in/78.25 (86.25, 94, 101.5, 109.25, 116.75, 124.5, 132, 139.75, 147.25, 155, 162.5)cm at bust and measures 24in/61cm from shoulder to hem. Briar is available in my Ravelry store now! There's no reason to panic. There's three whole days left in the OAL, and two of them are weekend days, so that's like 40 hours of crafting time right there, right? 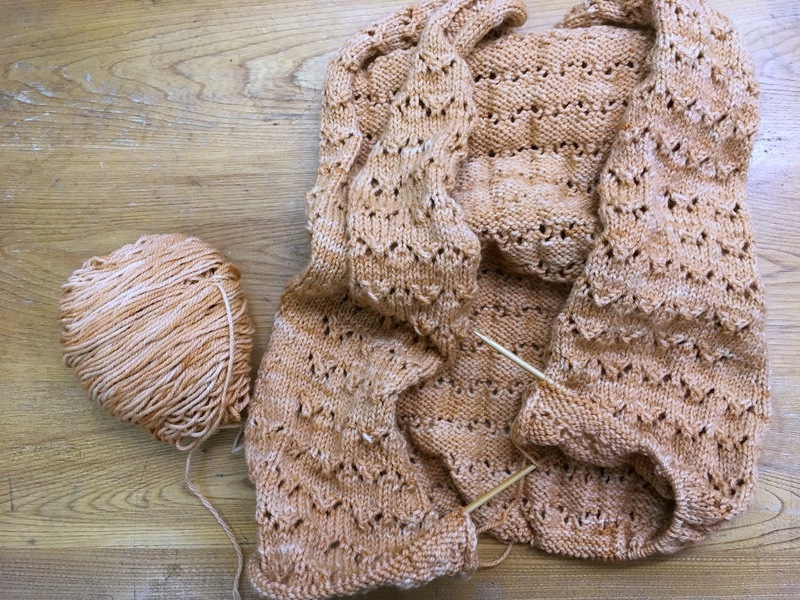 So it's no problem that your second sleeve has eight repeats to go, plus ribbing, and you still need to pick back your bind off to add more ribbing to the body, oh, and button bands, can't forget those, and a collar, and wait, you haven't even thought about buttons yet?? I mean, it's not like you haven't even cut out your dress yet- wait, what? 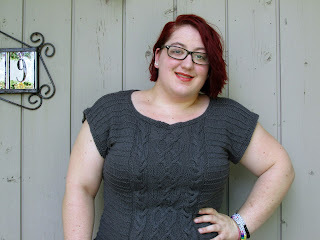 Oh, well, it's a quick dress, and as long as you're not doing something stupid like using one of the shiftiest fabrics known to man- oh, come on, are you serious? Well, how long can it really take to sew a dress, right? Well, at least you don't have anything to do this weekend, so you can just sit and focus on finishing your outfit. You don't need groceries, I'm sure there are some stale crackers lying around. And the dogs can walk themselves, dogs have cared for themselves for millions of years and they're fine. And as long as your hands don't cramp up or get tingly, you can keep going, right? Right? Guys, I might be in trouble. Well friends, the play is over, and I'm feeling a little lost. This show was harder than usual to say goodbye to, but my body and my voice are definitely ready for some rest. Last night I sat home and watched an old season of Great British Bake Off and picked up the second sleeve on my Hetty, and it was actually a nice change of pace. My Hetty is coming along swimmingly, and I shouldn't have a problem finishing it for the OAL deadline. I just have this second sleeve left, then I have to undo the bottom bind off and add some more ribbing rows (I didn't pay attention to the pattern and I don't love how it looks now), then just button bands and the collar. I haven't identified buttons for this yet, which could get tricky, but that's a problem for Future Kat. For the sewing part of the OAL, I finally traced my pattern. I tried cutting out the front bodice, but the fabric I'm using is shifty as heck, so I need to find a flannel sheet or something to lay under it for cutting. At this point, I'll be happy if I can get the dress cut out by the end of the OAL, so we'll see how the rest of the week progresses. Bramble is an adventurous top. 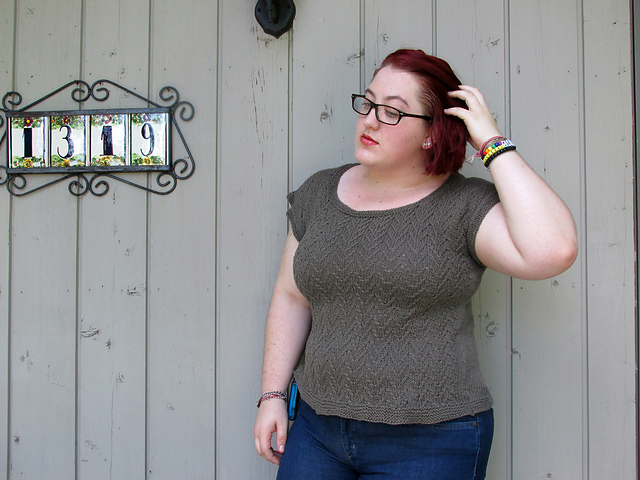 A playful mix of texture and cables make this one of my favorite tops, whether I’m on a nature walk, at the zoo, or on my way to Chick Flick night. Bramble is worked in two pieces from the bottom and seamed. Stitches are picked up for sleeves and neckband, which are worked in the round. 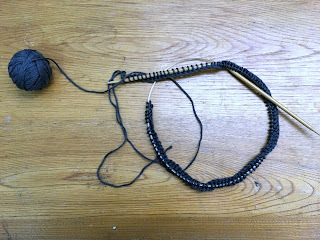 The pattern includes both written and charted instructions for the cable panel. 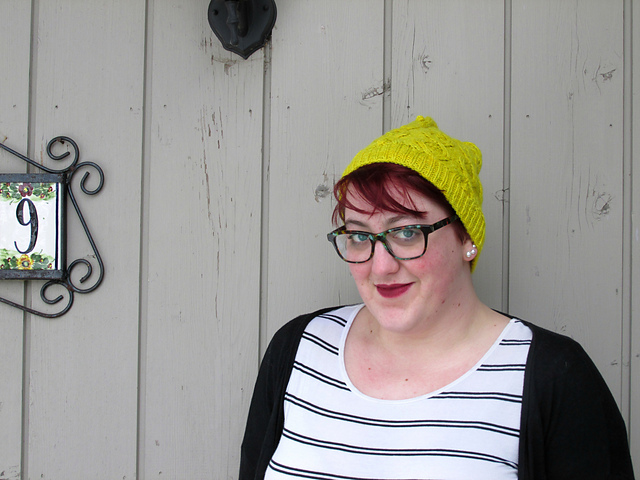 Bramble is available in my Ravelry store now! 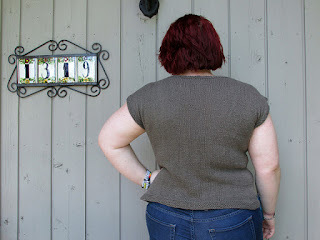 I've reached the point in my OAL Hetty body where I want to be knitting anything else but the body. 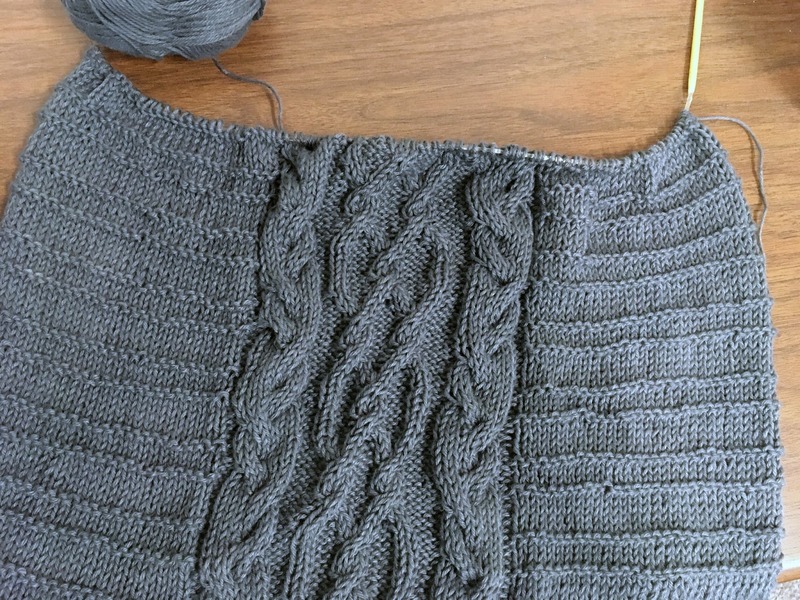 I'm adding quite a bit, to make this sweater hip length, and right now I'm at the point where I want to stop and measure after every repeat, and I still have a few more inches to go. I'm still enjoying it, but I'd rather be working on the button band or the sleeves. I'm still very excited for this sweater. I can attest that this yarn is indeed extremely cozy- earlier this week at play practice I had a minor blood sugar episode and needed a little nap, and I used what I had so far of the sweater body as a little blanket to keep my arms warm. 10/10, would snuggle again. 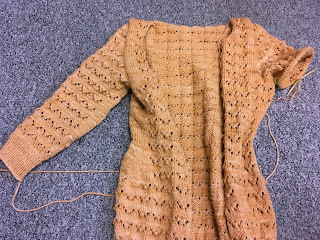 This is going to be such a great sweater once it's done. Tonight is our first dress rehearsal for the play, and I'm hoping to pound out these last few body repeats while I'm backstage. I have quite a bit of time backstage, and I really want to get this body finished, so fingers crossed! Stripes always remind me of summer– even stripes, crooked stripes, wavy stripes, and zigzag stripes. 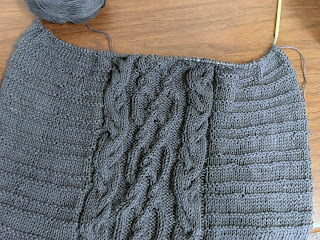 I love the subtle zigzags achieved with this cable pattern, and the resulting top is tons of fun. These fun zigzags spice up days spent at the library, lounging by the river, or listening to music on the Platz. Thistle is worked in two pieces from the bottom and seamed. 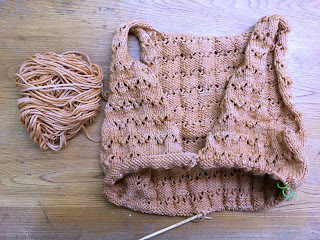 Stitches are picked up for sleeves and neckband, which are worked in the round. The pattern includes both written and charted instructions for the chevron cable pattern. 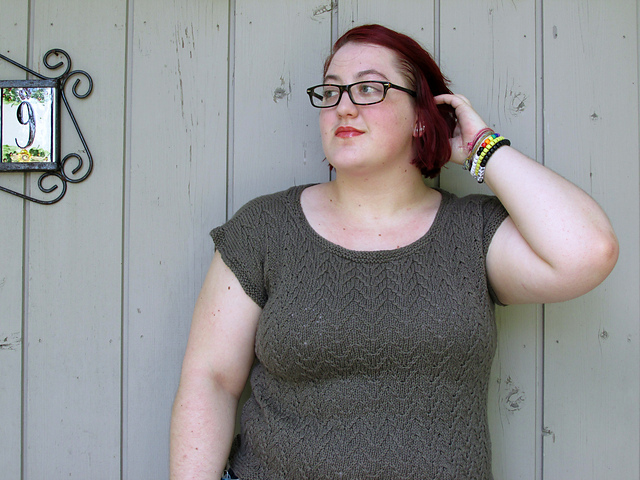 Thistle is available in my Ravelry store now! Hetty is just flying off the needles, and I really couldn't have chosen a more enjoyable knit to sink into after finishing up my collection. It's also really nice to have something easy to pick up and set down during play rehearsals- I have tons of backstage time, but we're still working some things, so I'm up and down a lot! Tonight's going to be my last night off until the 25th, so I'm planning on settling down with some nice mystery shows and getting my relaxation on. Finally, some collection news! The Scrubland Collection is inspired by some of my favorite prickly plants. 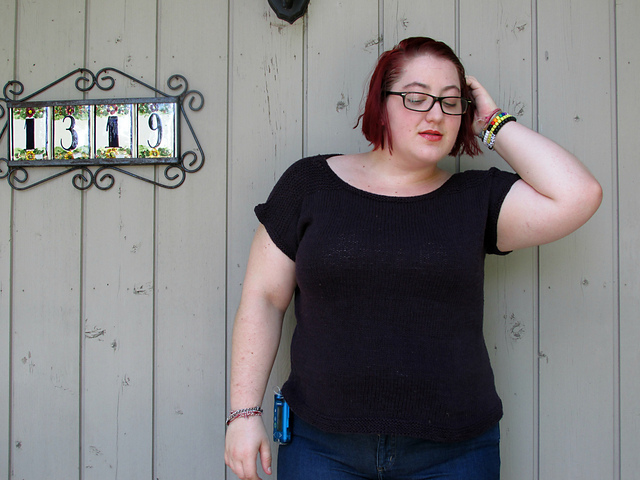 These three tops are perfect for any summer activity, whether it's a nature walk, a trip to the zoo, or an outdoor concert. 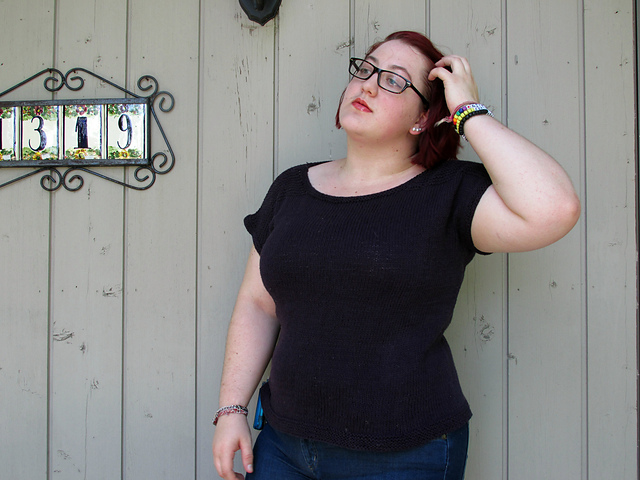 All three tops feature simple, bottom-up construction that result in casual, breezy tees. Each top is knit flat in two pieces and then seamed, keeping the projects portable until it's time for finishing. I'll be releasing one top each Monday through the end of July. Each of these tops has such a special place in my heart, and I really can't wait to share them with you! Monday evening at rehearsal I got that final top mostly finished. I still had a couple rounds on the collar left to do last night, but yesterday at lunch I let myself cast on for my OAL sweater. 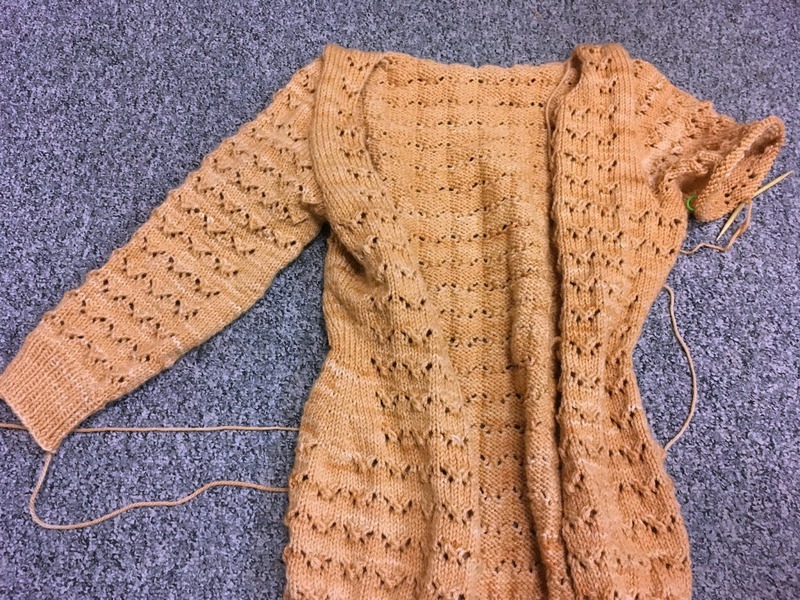 There's about two and a half weeks left in the OAL, and I don't know when I'm going to find time to sew my dress, but the sweater is coming along swimmingly so far. I'm knitting Hetty, and I've finished the upper back and picked up the stitches for the right front so far. 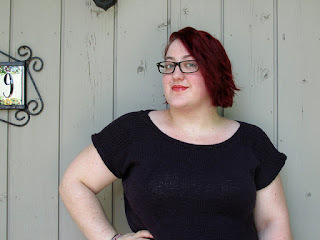 This sweater has been in my queue for ages (probably since Andi released it! ), and it's great to finally be working on it. 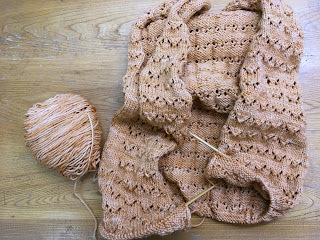 I love my linen and cotton blends, but it feels great to be knitting with wool again (as long as I'm inside with air conditioning- we're in the middle of a crazy heat wave here and I want to cry). Friends, I had such a productive weekend, I don't even know what to do with myself. This right here is the front of the final top in my upcoming collection, and all it needs is twelve rows of neck shaping. I'm ecstatic. I did all the finishing on my second top over the weekend too, so once this is done (hopefully today or tomorrow) all I have to worry about is photos and editing. We're finally at the run-through point in theater rehearsals, so I'm going to have quite a bit of knitting time the next couple of weeks. Yesterday I went through and circled all my size information in the pattern for my OAL sweater, so I'll be able to cast that on as soon as this top is done. 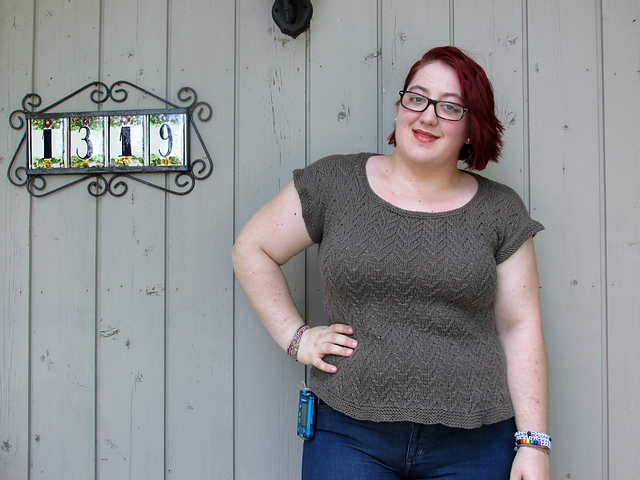 I started knitting for this collection on May 31, and I'm really impressed that I managed to knit three tops in six weeks. 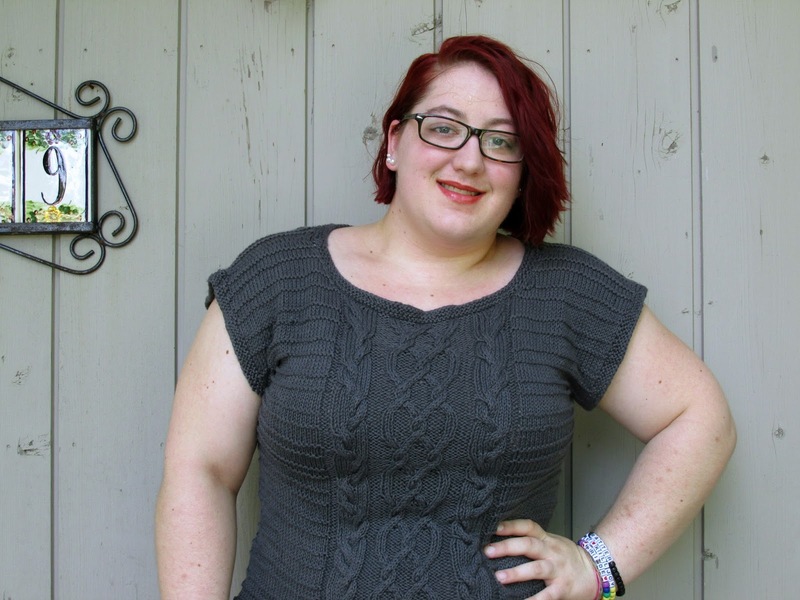 While the knitting has gone quickly, this whole project has taken up a lot of mental space, and I'm simultaneously ready and excited to share these patterns with you, and relieved and ready to knit something I don't really have to think about. And really, I couldn't have worked out the timing of this better. Community theater is going full throttle- this week is run-throughs, next week is tech, and production is July 21-24. So while I'll have plenty of backstage knitting time, I'm also going to be even more of an exhausted over-caffeinated mess than I usually am. I appear to have given myself a bad tendinitis flareup in my right thumb, which hasn't happened for a while, and is every bit as painful and inconvenient as I remember. The good news is, I can still knit. The bad news is, I can't really do much else. I'm popping ibuprofen every few hours and I have my thumb brace on, and hopefully this will sort itself out quickly. That's all I have for collection news. I still haven't started my OAL projects. but that's first on my list once this top is done. Hopefully my thumb will be feeling better by then, because I definitely can't sew with it like this. We're also two weeks away from production of Fiddler on the Roof, and it's starting to get real. We solidified the major dances this week, everyone is supposed to be off book, and we're getting down into the nitty gritty of scenes. The show is really coming together great, and I'm so thrilled to be a part of it.